Leftovers, you know I love them. Okay, I can’t get enough of them. It’s a great day on the home front when you can make a meal knowing that it is going to last you for several. These slow cooker beef short ribs still melt me, in a foodie kind of way of course. You multiply that love ten fold when you can turn them into three additional meals. 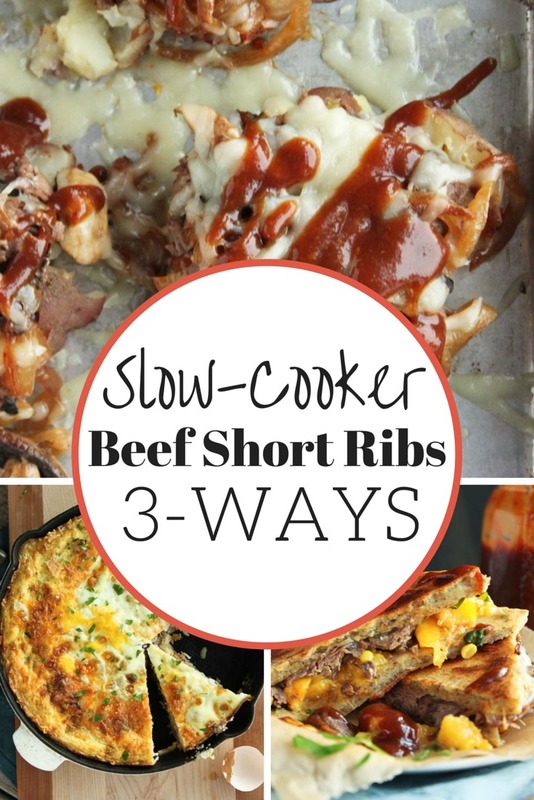 It happened, it really really happened, slow cooker short ribs made three ways. 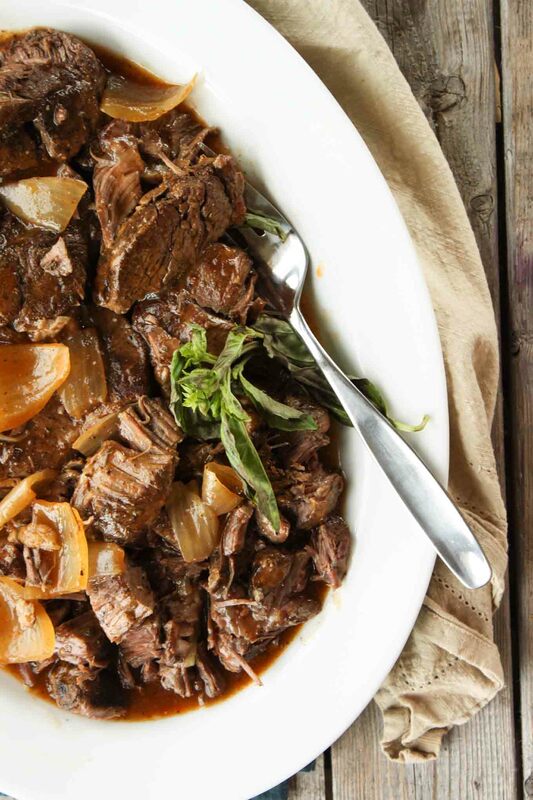 It all begins with the ultimate slow cooker beef short rib recipe. Stunning, savory, delicious and oh so easy to cook in bulk and reheat for future use. Start here and you won’t be sorry. Then we move into exhibit A. Think breakfast. Think delicious. Think hash browns and eggs with a mix of slow cooker beef short ribs, caramelized onions, zucchini and mushrooms. 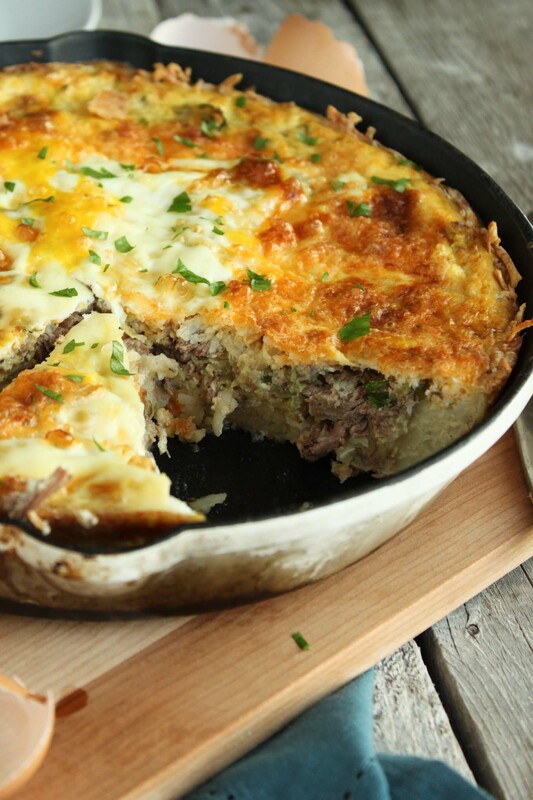 Think Philly cheese steak Quiche. Think satisfaction. Okay, enough with the thinks…. 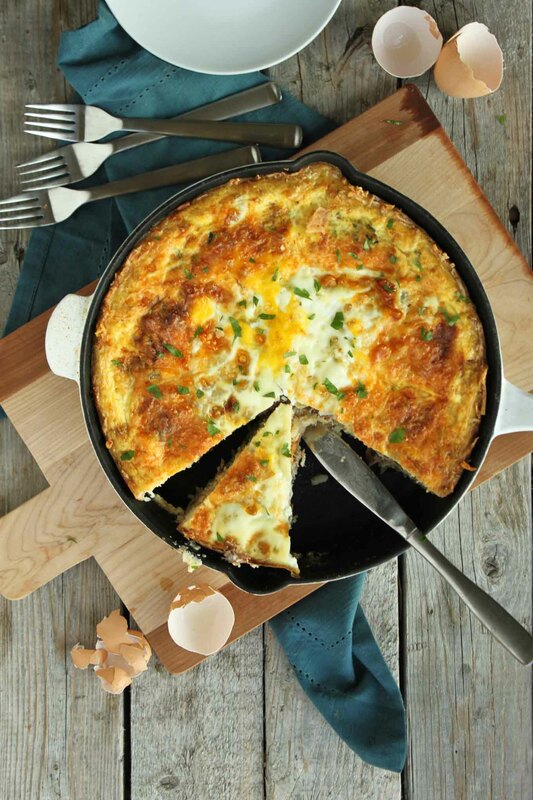 seriously though this skillet quiche would be a great last minute dinner or even to prep ahead and eat all week-long. The crispy layer of hash browns topped with the caramelized veggies and savory pulled beef all cooked together with the perfectly light and fluffy egg. Helllloooo beautiful and healllllooooo breakfast solution. Exhibit B is up there as one of our go-to meals. 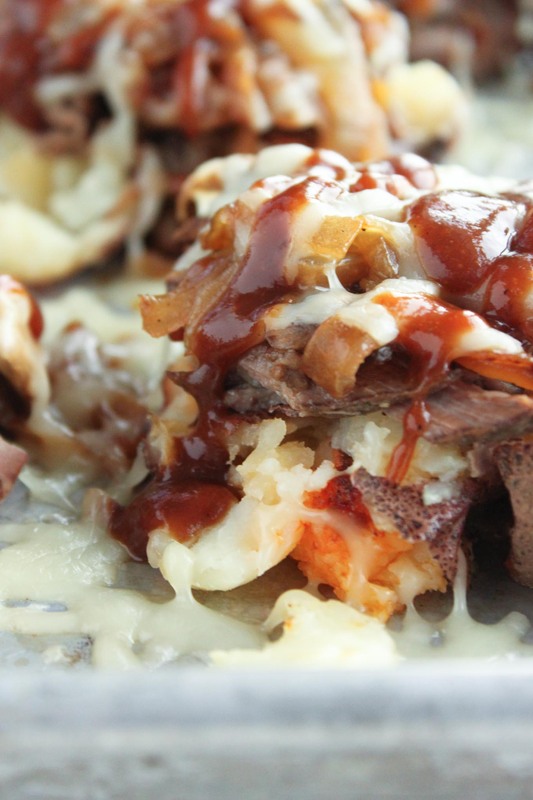 But who could go wrong with a smashed potato pile? I can tell you, it’s a lot of goodness in one bite. I know this concept isn’t new to anyone here at SRW. I kind of, maybe, repeat it often, think buffalo chicken smashers. 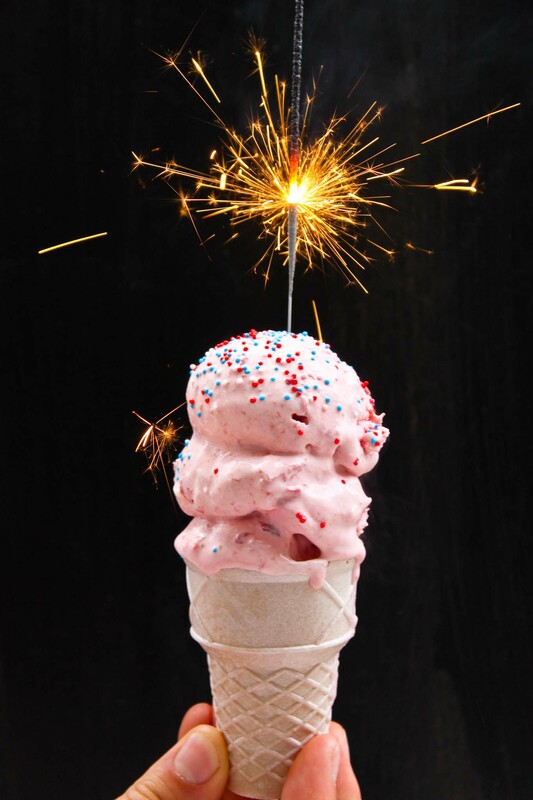 ->YES PLEASE<- And why re-invent the wheel when it is already delicious to begin with? You don’t! 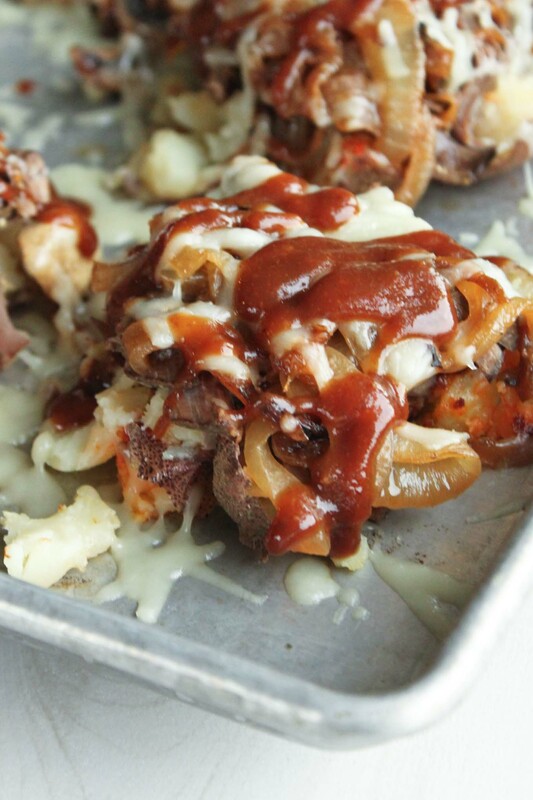 Creamy freshly dug potatoes cooked and smashed smothered in butter, seasonings, slow cooker beef short ribs, caramelized onions again because you can never get enough of that goodness all doused in my new favorite, homemade BBQ sauzzzz. I feel like me and BBQ have gone to a whole new level this week. I haven’t found many foods that my new rendition of this homemade BBQ sauce recipe isn’t good on. Quiche from above, grain-free flatbread, any and all meat, as a dipping sauce for cheese, cucumbers, carrots, did I mention good on any and everything? I also totally understand why so many people have that secret BBQ sauce they keep in their back pocket, pulling them out to wow their guest. The secret special sauce that leaves everyone talking about it. Then again, it’s sauce and you can’t go wrong with sauce. Nope, nadda, can’t. Sauce it up, everything just.use.sauce. Lastly, exhibit C. Let’s just stare at it for a little while….. I can’t. I don’t even. There are no words. Amazing on a plate, partially because of that sauce again but mostly because of the rockin’ flavor combination. Not to mention, it’s like a Panini. I don’t know how or when the thought of using my flatbread recipe as sandwich bread came to mind but I’ve lost a lot of good months not realizing this. 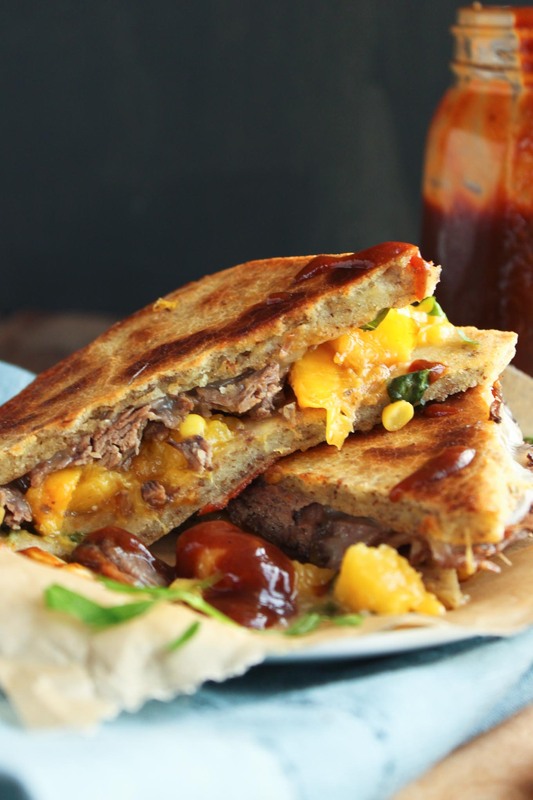 Slow cooker beef short ribs with melty cheese and a sweet peach and corn salsa drizzled in the peach BBQ all squished between two slices of that soft, buttered, grilled, crisp flatbread. DYING. I’d be lying if I told you we ate this for only one meal. The first time, I didn’t like the pictures. Bummer, we make it again. The second night, I forgot the BBQ. Shame, shame. The third night, nailed it. The better news I didn’t even care we ate this three nights in a row. That sandwich, hello new concept at SRW, is stellar. Boy have I missed you bread, keeping my fingers somewhat clean, providing the foundation to stuff the goodies in. All three meals came from one batch of that slow cooker beef short rib recipe. Read that again, slow cooker beef short ribs made three ways. Yes, you are reading that correct. This summarized our weekly menu and while slightly repetitive in one flavor the different variations in meals made it seem like something new day in and day out. I mean you wouldn’t have to put the peach BBQ sauce on everything, but then again I can’t say you’d regret it either. This is how you cook on limited time and on a limited budget. Cook once, eat all week and eat well I might add. Mix hash browns, olive oil and salt and pepper to taste in a mixing bowl. 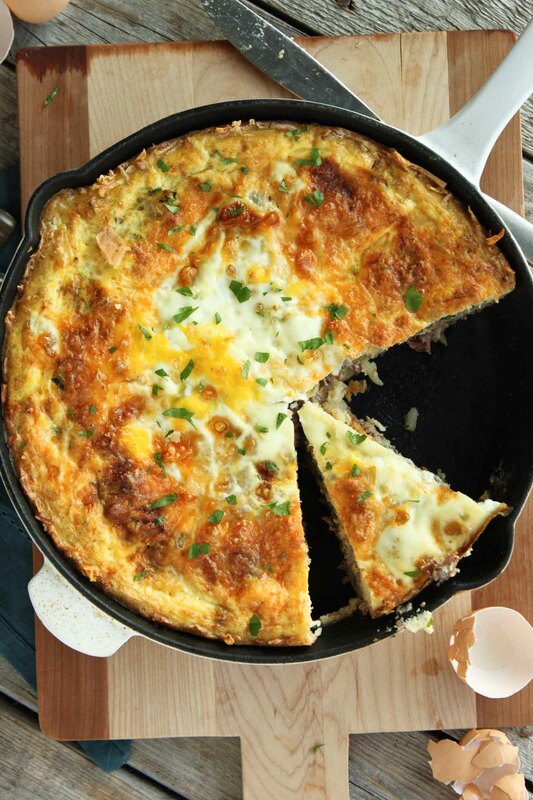 Grease a 10" oven-safe skillet and add the hash brown mixture, pressing down to pack it tightly on the bottom and sides forming a pie-like crust. Bake at 425 degrees or until the edges have browned, about 25 minutes. Meanwhile in a separate non-stick pan over medium high heat, saute the onions until just beginning to caramelize and add the zucchini and mushrooms in 2 tablespoon of olive oil for about 10-12 minutes until tender. Drain any excess liquid. Once the hash brown crust is done, spread half the cheddar cheese along the bottom of the crust. Add shredded short ribs, and zucchini mixture to the pan. Let it cool for at least 10 minutes before serving. Garnish with BBQ sauce, chopped basil and or sliced green onions. Wash and boil potatoes in a pot. Once fork tender remove and place on a prepared baking sheet. Cut with a sharp knife halfway through the potato making an X-shape. With a potato masher, smash the potato working to keep it all together. Repeat with remaining potatoes. Add a pat of butter to the top of each potato. Sprinkle with garlic powder, paprika, salt and pepper. 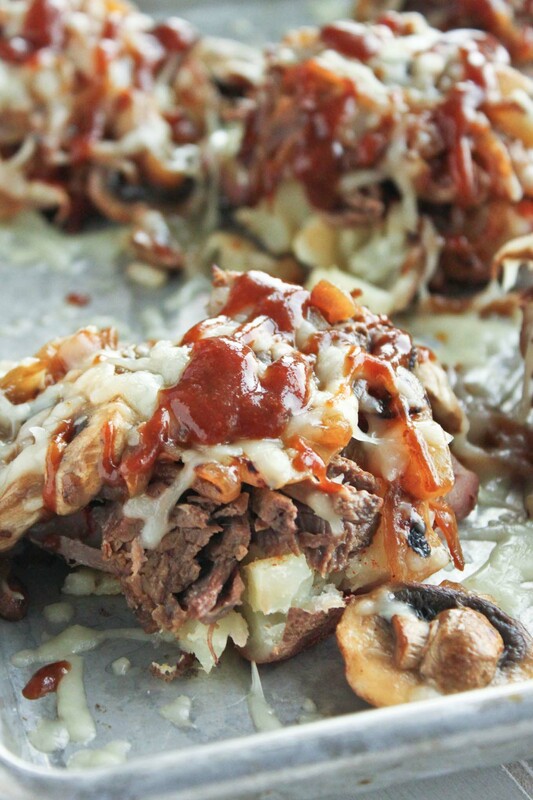 Top with ¼ cup shredded short ribs and some onions and mushrooms. Place in the oven at 425 degrees and cook until cheese has melted and flavors have combined. 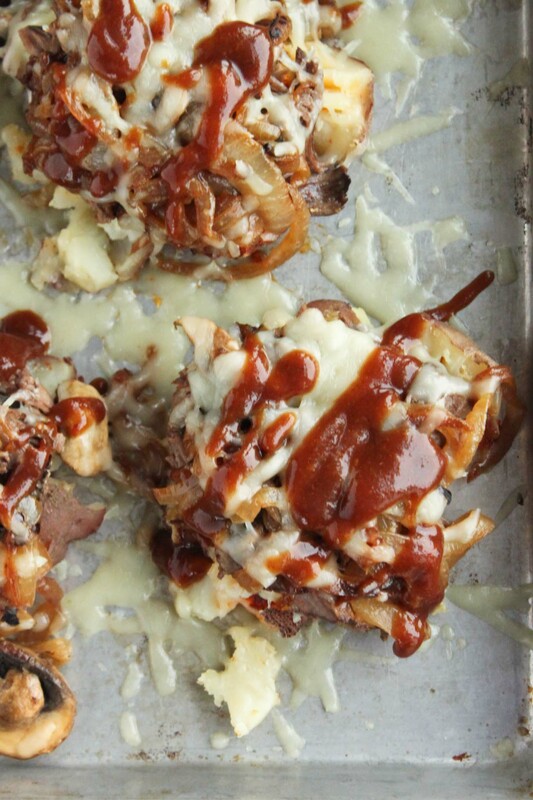 Remove and drizzle with homemade BBQ sauce and enjoy. Make flatbread into a square according to directions. Using a pizza cutter, cut flatbread to resemble sandwich bread. Meanwhile mix together peach, sweet corn, tomato and basil in a small skillet over medium heat. Heat just to warm and remove. In same skillet over medium heat, butter one side of flatbread. 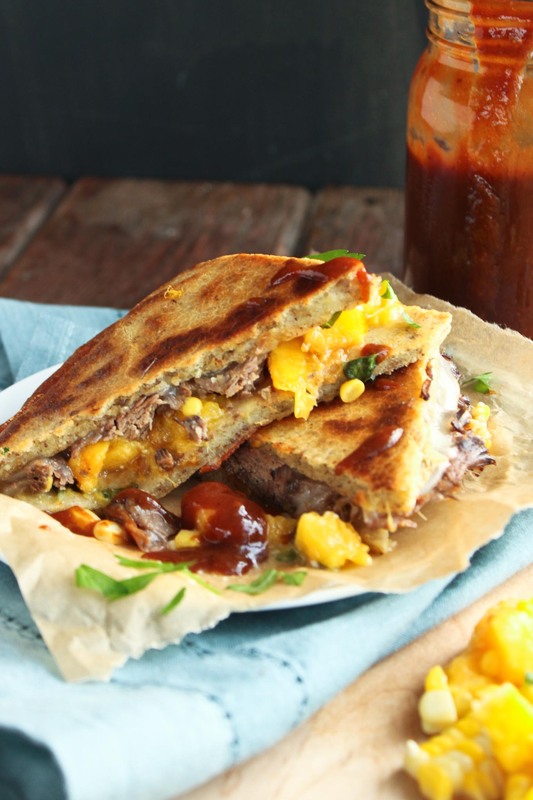 Place in pan and top with a slice of cheese, BBQ sauce, shredded short ribs and the peach and corn salsa. Butter another piece of bread and place on top. 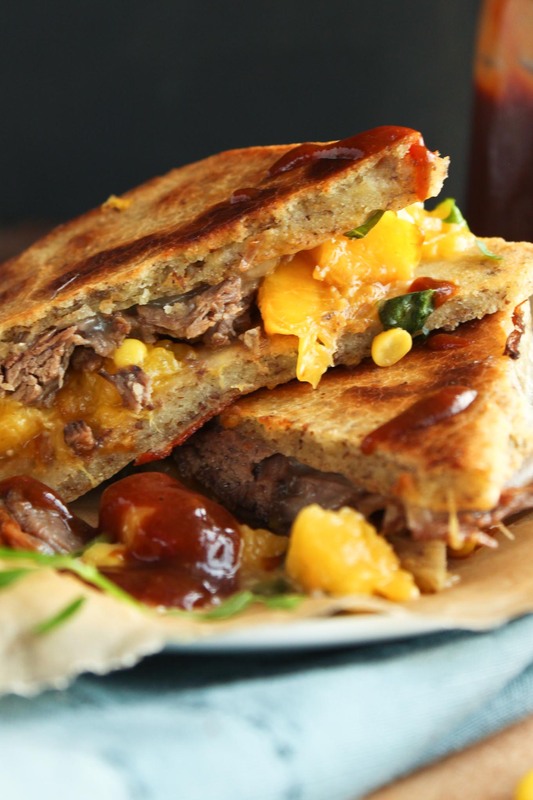 Smash down sandwich with a spatula and cook until both sides are crips and cheese is melted. * Can use panini press if desired. Add all ingredients for the BBQ sauce to a small saucepan. Add in peaches. Let simmer for 20-30 minutes, stirring occasionally. Remove from heat and place in a blender or use an immersion blender. Use or store in the refrigerator for up to two weeks.